Group member, Hilary Cox, also champions Walking and Cycling at local and district council levels. An active pensioner she tackled Mount Kilimanjaro just a few weeks after a knee replacement, raising funds for charity on the way! Hilary says: A tough but rewarding challenge; there’s no doubt that regular steady walking is beneficial. 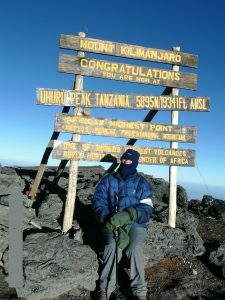 Good fitting boots and all weather gear add up to make an experience like Kilimanjaro an awesome appreciation of what can be achieved. But you don’t have to go to such extremes to reap the benefits from exercise, fresh air and the great outdoors, it’s on our doorstep. Just do it. Previous Article ABOVE AND BEYOND – OR NORMAL FOR COASTHOPPER?